PTC hosts a star studded premier of Zorawar tonight! The biggest film in the history of Punjabi cinema is finally here as Zorawar hits theater screens tomorrow. Music sensation Honey Singh is back with a bang with PTC Motion Pictures’ Zorawar produced by Rajiee M Shinde and Rabindra Narayan and directed by Vinnil Markan. The action packed film, packaged with all the ingredients of an exciting entertainer garnered massive anticipation ever since the first announcement, not just in India but overseas as well. Zorawar will in six major territories across the world including USA, UK, Australia, Canada, South Africa and New Zealand –a first for any Punjabi mainstream film. Tonight, PTC Motion Pictures hosted a star studded premier of the film in Chandigarh .The premier screening saw the starcast including Pawan Malhotra, Mukul Dev, Bani Gurbani and Parul Gulati and the who’s who of the Chandigarh circuit attend. Held at the Elante mall – PVR , Ammy Virk,Preet Harpal,Babbal Rai ,Hardy Sandhu,Ranjeet Bawa ,Mankirat Aulakh ,Sippy Gill were spotted at the special screening and were the first to catch the highly anticipated film. Also playing the perfect hosts were producers Rajiee M Shinde and Rabindra Narayan. 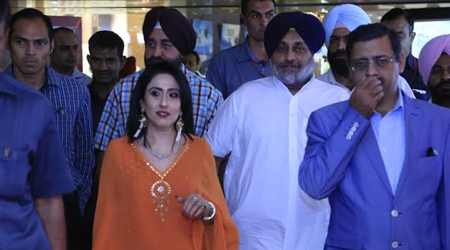 Guests walked out touting Zorawar the next "Bahubhali of Punjab" considering the scale of the film. Having shot across South Africa, London and Punjab ,the film boasts of never seen before locations.With Zorawar being Honey’s first feature film as a hero, the music resonated with millions of music lovers across the country and Honey Singh's fans across the globe. The film has also been trending on various social media platforms ever since the trailer was out,hitting the one million mark across the board. Yuva Bhaskar: PTC hosts a star studded premier of Zorawar tonight!